History-sleuths, amateur and professional, are invited to search through wide collection of personal and State archives of cultural, sporting, political and social documents. AMATEUR HISTORIANS REJOICE: Ireland’s archive collections have found a new central home online. The website www.iar.ie, launched today, allows the public to search a wide range of Irish archives online. Some of the collections featured include the Irish Film Archive, the Guinness family archives, archives from UCC’s Boole Library and a large number of city and county council archives. For now, it is primarily a descriptive site but we see it as the first step on the ladder to digitising entire collections. For example, we have one collection that is 175 boxes’ worth of documents and it has not been possible to put them all up as yet. State-funded archiving in Ireland is a relatively recent phenomenon, only being properly established in the last 30 to 40 years. However, the IAR website brings together a large number of collections from around the country, preserved by a range of organisations. It includes records from current and defunct government and local government agencies, personal contributions, estate records, clubs, societies, trade unions, religious, cultural, sporting and political organisations. One personal archive included is that of Nancy McCarthy, a member of the Cork arts scene who had a romantic relationship with Frank O’Connor when they both worked with the Cork Drama League and later, a lifelong friendship. Her archive, donated to UCC Library by O’Connor’s wife Harriet O’Donovan-Sheehy, who became executor of McCarthy’s estate, contains fascinating personal correspondence between McCarthy and a host of luminaries such as actors Cyril Cusack and Micheál Mac Liammóir, editor of the New Yorker William Maxwell and sculptor Seamus Murphy. The range of audio, video, written and aural testimony ranges from records of traditional trades, crafts and traditions that were practised in Ireland around 1850 to more contemporary material. Film buffs, for example, will be interested in production material harvested from Jim Sheridan’s Hell’s Kitchen International Ltd production company. The company is still going but some materials from films such as My Left Foot, The Field, Into the West and The Boxer were given to the Irish Film Archive following the closure of Hell’s Kitchen’s Dublin office in 2009. Brian McGee says one of his personal favourite archives referenced on the site is a recent collection of deeds on properties in Cork city dating back to the 16th and 17th centuries. These deeds were found lying in a skip in the Netherlands. We would have lots from local government archives, for example documents from the workhouses’ board of guardians. The important thing about the site is that every collection on it is accessible and available to the public. The long-term hope is that it will one day all be digitised, and some archives are going in that direction already. 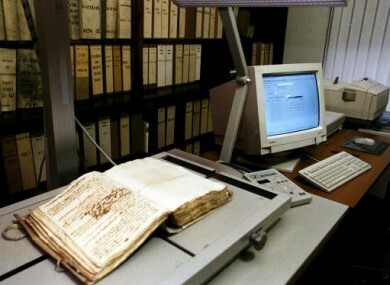 Limerick city archives have been digitising a lot of their material recently. Email “Ireland's archive collections go online”. Feedback on “Ireland's archive collections go online”.